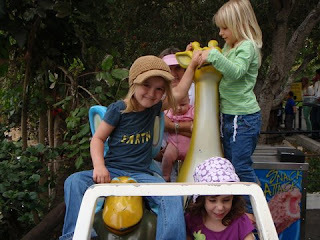 Becoming a member of the Santa Barbara Zoo is kind of a necessity if you live in town. Groups of friends meet there, it is the perfect place to go if the kids are boogery and can't be around their playmates, and perfect in the afternoons if you need to waste an hour or so at the witching time. For our family that time is from 4pm to 5pm. 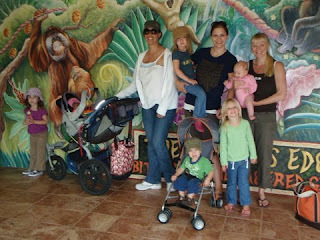 There are weeks here and there where we miss our normal trips to the zoo. This week has not been one of them. To count, we have been there three times. Once with daddy on Sunday to unwind from a long weekend, once by ourselves finishing up a mellow afternoon, and then yesterday with a hoard of friends. 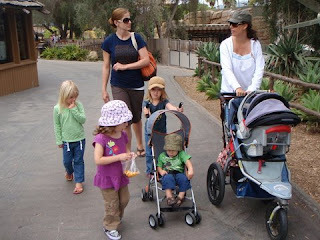 Going to the zoo with my mommy pals, all with two kids, has increased the need for us to excell at crowd control. When the kids are on good behavior (like yesterday) it is hectic but fun. Just as a side note, I love when friends take photos and email them right away!